What is the first thing that comes to mind when you are planning a home event or corporate function? Food, of course! The last time our office hosted a luncheon event, my colleagues were scrambling on their work stations googling for the “best” caterer in Singapore in hope of having some buffet food. I think it is common knowledge that there are a few major food caterers in Singapore but given that consumers are empowered by internet these days, sourcing for information becomes an ABC task. credit card details over the net. This short 60 seconds video should give a clear illustration of the ordering process, all done at the click of a few buttons online! With an array of catering options for different events, one has the flexibility to customise the choices of caterers based on the budget in mind. More importantly, you get to filter the types of cuisine that you are most interested in to help you save time! While it is common for bloggers to review restaurants or the latest cafes that just popped up round the corner, FoodLine also allows users to review the caterers upon trying their food and service. This not only earns you cash rewards but also plays a part in ensuring quality assurance in orders. Your review matters because it also affects the caterer’s ranking on FoodLine, giving them greater incentive to uphold their reputation by delivering the best food and service to customers. With more than 5,000 reviews uploaded by customers where some include pictures, you can have a rough gauge on what to expect for your order from the selected caterer. If buffet is not quite what you are looking for, FoodLine also lists non-buffet catering options such as packed daily meals and even confinement meals for the natal essentials at your doorsteps. With trial options up to a month long package, one can be assured the basic needs are well taken care of! 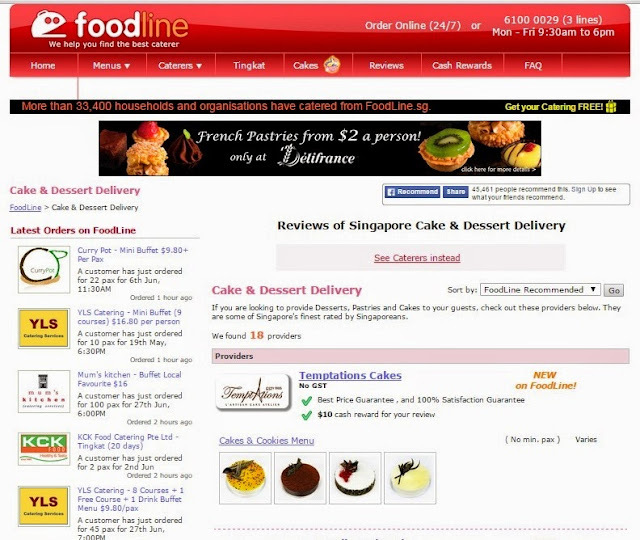 Having established since 2009, FoodLine consistently introduces new offerings to users and they have a newly opened cake section (http://www.foodline.sg/cakes/) on their webpage where one can find baby first month and wedding cake packages! Expect to enjoy extra savings as there are ongoing promotions with selected caterers from time to time and for the price conscious customers, you may also wish to note that there are plenty of caterers on FoodLine that have GST included in their pricing! Speaking of competitive pricing, FoodLine also has a “Best Price Guarantee” scheme launched just last week, which is set to match the lower price found of the same menu by the same caterer. This gives the assurance that you are always getting the best value for your dollar! Overall, I thought that FoodLine is an easy-to-access online platform that offers a one-stop solution to homes looking to arrange a family event or even companies looking to host a nice cocktail reception. With competitive pricing and assurance backed by fellow customers, it would not be long till we hop on to FoodLine for our next booking! 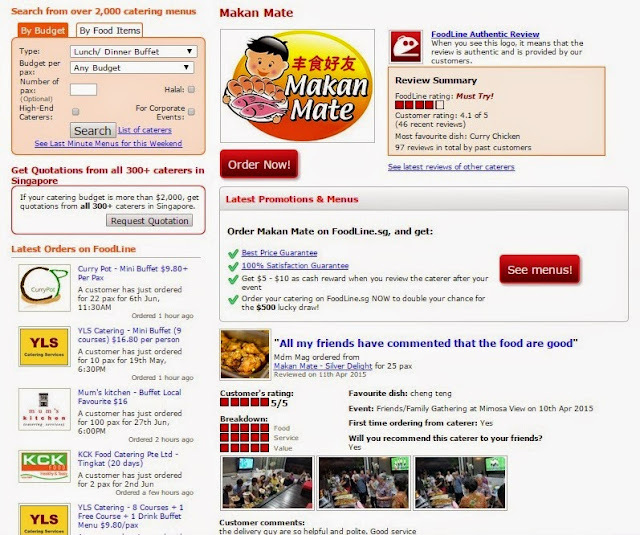 For more details, please visit www.foodline.sg.